Well-groomed eyebrows can decorate the face even to visually adjust its shape. It is therefore necessary to pay due attention to the makeup of the eyebrows. One of the conditions of beauty of the eyebrows is their color. Monitor the color of the eyebrows, especially, if you dye your hair. If you do not do this, a new unnatural hair color will be evident. If the selected hue is radically different from the natural, without paint for eyebrows is not enough. Paint for eyebrows and eyelashes will give them the right shade for about a month, thereby greatly diminished daily chores. It is very important to choose a quality paint. In any case, you cannot dye your eyebrows with hair dye. It is better to give preference to trusted brands that specializes in professional staining. The product will be expensive, but the result will please both the probability of allergies is minimized. Easiest option is to contact the salon and trust your eyebrows to the professionals who will help determine the tone. If you decide to carry out dyeing at home, you need to use a simple rule. The dark one should give preference to the color of the eyebrows three shades lighter than hair, and the blond – three shades darker. Ginger is recommended to use brown tones. 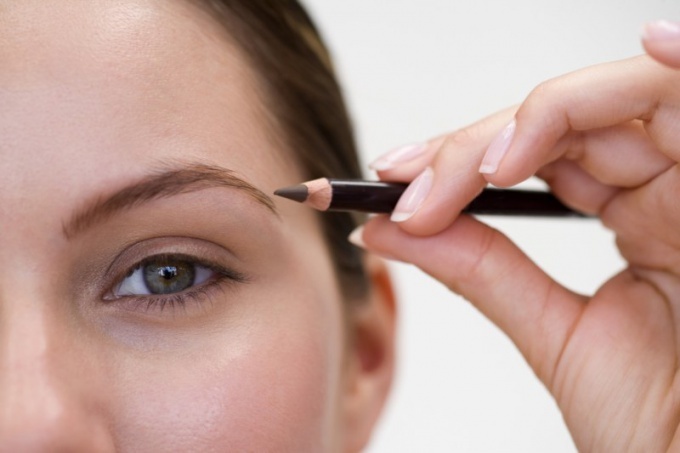 The day before the dyeing eyebrows, you need to make the desired shape with tweezers. Before applying the paint should not do it, because plucking can leave microdamages of the skin. This can begin irritation. Most of the paints supplied with instructions for use. It shows how to dissolve the dye mixture and how long to sustain it on the eyebrows to get a particular shade. The skin around your eyebrows before the procedure it is recommended to apply a rich cream that she accidentally stained. For daily makeup use eyebrow pencils. The color of the pencil should be darker than the hair color, but lighter-colored mascara. Comb the eyebrow brush and apply pencil strokes along the hairline. On the widest part of the eyebrow should be applied over a dark color, and her ends lighter. In the end you need to lightly feather the pencil again, scratching her eyebrows. It is worth considering that to wet the skin color will be more bright. There is also a special powder for eyebrows, which is a dense substance with a coloring pigment. This powder will help to disguise a bad hair removal of the eyebrows, it is very stable. It can be applied with a stiff brush on the same principle as the pencil.